U.S. elections and political party system change, the American presidency, public opinion, judicial politics, and comparative constitutional law. A native of Charleston, South Carolina, Professor Lamis earned a B.A. in history from the College of Charleston in 1968, a Ph.D. in political science from Vanderbilt University in 1982 and a J.D. from the University of Maryland Law School in 1984. A specialist on elections and political parties, he is the author of The Two-Party South, 2d expanded edition (Oxford University Press, 1990), which was co-winner of the V. O. Key Award when the book’s first edition was published in 1984. He has also written various articles and book chapters on the politics of the American South. For example, in 2005 he published “The Emergence of a Two-Party System: Southern Politics in the Twentieth Century,” in Craig S. Pascoe, Karen Trahan Leathem, and Andy Ambrose, eds., The American South in the Twentieth Century (University of Georgia Press, 2005), pp. 225-246. In 1991, he sketched his predictions for the politics of his native region in “The Future of Southern Politics: New Directions for Dixie,” in Joe P. Dunn and Howard L. Preston, eds., The Future South: A Historical Perspective for the Twenty-first Century (University of Illinois Press), pp. 49-80. Shortly after his arrival at Case two decades ago, he was asked by the university’s magazine to write a first-person account of how he came to focus his research on the politics of his native region. Starting with a detailed description of a memorable, unplanned “confrontation” with George Wallace, the segregationist Alabama governor, while working as a TV journalist in South Carolina, Prof. Lamis tells how his extensive first-hand contact with the chaotic partisan politics of Dixie in the latter part of the 1960s and early 1970s led to his study of the rise of two-party competition in the old one-party Democratic South after he became a political science graduate student at Vanderbilt University. The CWRU Magazine article is reprinted here. Professor Lamis is also co-editor of Ohio Politics, revised & updated edition (Kent State University Press, 2007). He wrote the book’s concluding chapter on Ohio electoral and political party system change from the Civil War through the historic 2006 election. When the first edition of Ohio Politics was published in 1994, it was his first book project involving collaboration among political scientists and journalists. Click here for more on the new edition of Ohio Politics. His second edited book, Southern Politics in the 1990’s, was published by Louisiana State University Press in 1999. He is the author of the lengthy introductory and concluding chapters of this collaborative work that contains eleven state chapters written by teams of Southern political scientists and journalists. His concluding chapter to the volume seeks to place Southern electoral patterns within the broader context of overall national electoral and party system change. A review of this book is reprinted here. Before joining the Case Western Reserve University faculty in 1988, Dr. Lamis taught at the University of North Florida (1985- 1988) and the University of Mississippi (1981-1985) and worked as a research assistant for James L. Sundquist at the Brookings Institution in Washington (1980-1981). From September 1985 to August 1986, he taught at U.S. military bases in England, Greece, Spain, and Turkey as a visiting professor in Troy State University’s graduate public administration program in Europe. In the summer of 1984, he traveled throughout Cameroon in West Africa as part of a U.S. government-sponsored Fulbright Groups Project Abroad. Prior to beginning graduate school at Vanderbilt in the fall of 1973, he worked as a newspaper reporter at the Arizona Daily Star in Tucson and at the Columbia Record in South Carolina’s capital and served as a supply officer in the U.S. Navy in Iceland. During his last two years in college, he worked as a part-time television reporter for the CBS affiliate in Charleston, WCSC-TV. While in graduate school at Vanderbilt, he worked as a part-time copy editor at the Nashville Tennessean. Later, he was a regional news editor and copy editor at the Bergen Record in New Jersey, and, while writing his Ph.D. dissertation and attending law school at the University of Maryland, he worked as a copy editor at the Baltimore Sun. At that time, he also taught part-time at Towson University in suburban Baltimore. Recently he was delighted to be asked by the editor of the International Encyclopedia of the Social Sciences, 2nd ed., to write a profile of his favorite political scientist, V. O. Key, Jr. His Key article, which was published in early 2008, is reprinted here. At Case, in addition to being a member of the Faculty Senate and various university committees, he founded in the spring of 1989 the popular on-going faculty/staff Friday public affairs discussion forum. In 1992 he was an initial organizer of a university-wide public policy initiative, which sponsored over a dozen two-hour forums under his direction. He also initiated a network of Northeast Ohio political scientists in 1989 that promoted collaborative contact among area political scientists for nearly two decades. In 1997, he took a bar examination for the first time, passed it, and was admitted to practice law in Ohio by the Ohio Supreme Court. He has kept his law license current since then by attending the required Continuing Legal Education courses every two years. Prof. Lamis and his wife, Renee, published an opinion article in the Pittsburgh Post-Gazette on October 14, 2007, that argued for a major restructuring of the presidential nomination system. The article is reprinted here. 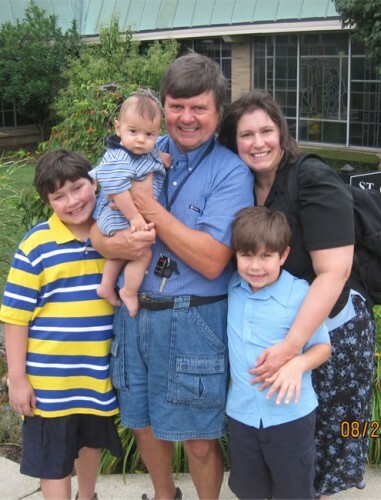 * Professor Lamis is pictured in an August 2010 photo with his wife, Renee, also a political scientist and the author of The Realignment of Pennsylvania Politics Since 1960 (Pennsylvania State University Press, 2009), and their sons, Peter (far left), then nine, and Alexander, then seven, plus their new baby, Nicholas, then seven months old.